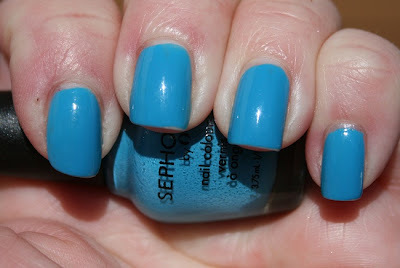 For this picture, I topped it with one coat of Celibacy Club, also from the Glee collection. And I left this pic big and blurry so you can see all the gorgeous colors in there. How pretty is that? Disclosure: The entire Glee collection was purchased by Sasha for her personal collection. I love the Glee set of minis. Celibacy Club is my favorite...maybe even my favorite nail polish EVER. It makes me really sad that it isn't available in a full size bottle. OMG, that turquoise color was pretty on it's own but then with the added glitter -- it's just gorgeousness!